Upon arriving in suitable breeding habitat, male Yellow-throated Vireos typically stay in the tops of mature deciduous trees, usually oaks and maples, and persistently sing while foraging. Five to ten minutes may pass before they fly to another tree (James 1996). They have a lovely harsh, burry quality to their song with the ‘hee-o’ notes typically quite far-carrying. The note-pause-note-pause style demonstrates what is termed as immediate variety, in which each subsequent song bout is different from the previous one. I videotaped this Yellow-throated Vireo in song along Frontenac Rd. in Mountain Grove, Ontario on 22 May 2015. 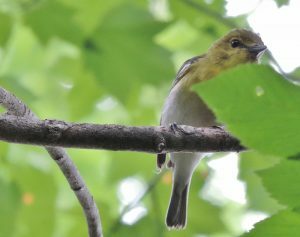 Photo: Yellow-throated Vireo photographed as it scolded me at eye level near Big Salmon Lake in Frontenac Provincial Park. June 2015. James, R.D. 1996. 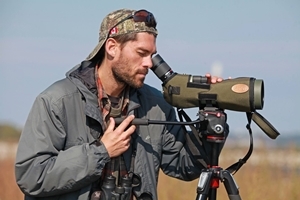 Yellow-throated and Solitary Vireos in Ontario: introduction and behaviour of unmated males. Ontario Birds 14(2): 45-49.